Welcome to Cloughan Farm & Cookery School Kids Cookery And Baking Classes. 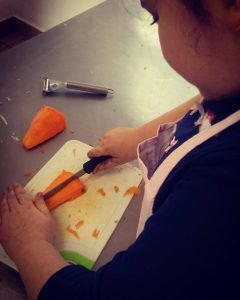 We provide hands on cookery classes for kids aged from 5-12yrs . 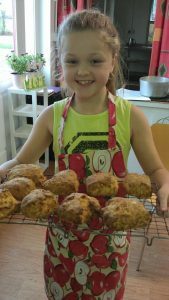 We believe its important for kids to learn how to weigh out, measure and mix their ingredients so therefore all the recipes are prepared from search. After the eggs are collected from the hen house, seasonal vegetables & herbs harvested from the cookery school kitchen garden,and cooking and baking is complete we all then sit down to enjoy the fruits of our labor ..
We supply recipes,ingredients and lunch plus kids will bring home some of what they have cooked & baked on the day. 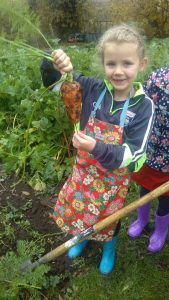 Kids will begin the day by digging and cutting many of their own vegetables and herbs from our cookery school kitchen garden and collecting freshly laid eggs in the hen house. Next its off with the wellies, into the kitchen and on with the aprons. Once the sleeves are rolled up, the hands are washed, it’s time to get the chopping boards & knives out for lots of topping & tailing, slicing and dicing.. When the students have prepared and cooked all their dishes for scratch, they will all sit down to enjoy the fruits of their labor but always leaving some delicious home baking on wire trays to cool off, or desserts setting in the fridge. After the main meal is eaten it time to get those piping bags into action for a bit of swirling and curling, hey it decorating time. Once decorating is completed students finally get to taste their yummys before finishing off their day. At the end of the class students will box away their culinary delights and bites to be taking home and enjoyed later among family and friends.